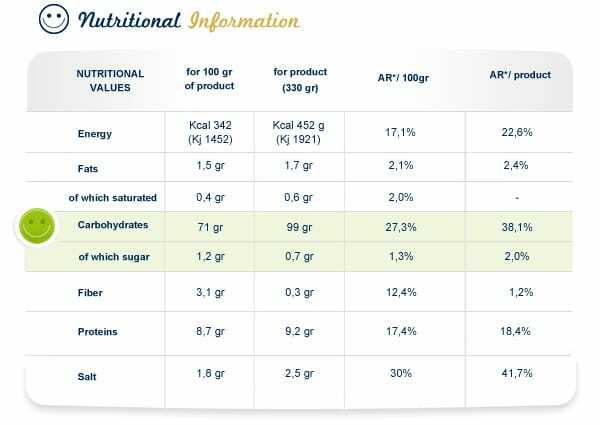 We choose natural and high quality dehydrated ingredients to give to our Risottos a real flavour and keep unchanged the nutritional and organoleptic qualities of the recipe; so we don’t need flavor enhancers such as glutamate! Carnaroli rice 89,6%, rice flour, fish-based aromatic preparation (soy), salt, 1% tomato, squid 0,8%, clams 0,7%, rice starch, vegetable broth (Salt, Flavor Natural, Dextrose, Potato Starch, Sugar, Spices, Onion, Garlic, Tomato), 0.4% shrimp, olive oil in powder, natural flavors, 0.1% parsley, glucose syrup, milk protein. It may contain traces of celery and soya.